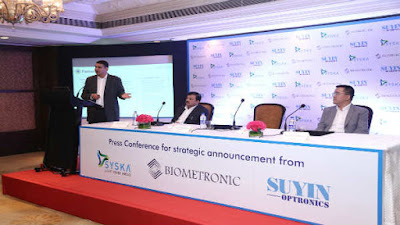 FranchiseIndia, IndiaTimes, BusinessStandard: SYSKA Group (India), Biometronic Pte. (Singapore), and Suyin Optronics Corp. (Taiwan) partner to set up India’s first camera module factory in Noida. The total investment for the facility is $30m. The factory will have a clean room for production capacity of 5 million pieces per month. The new factory will manufacture camera modules for mobile phones, automotive industry (Rear view camera), medical, security industry, and defense industry (Drones). Syska Group has 49% stake in the company whereas Biometronic has 41% stake and Suyin Optronics has 10% stake in the new entity.